Whisk together lemon juice, lemon zest, olive oil, mustard, garlic, salt and pepper to make marinade. The marinade should be thick. Place the salmon in a glass baking dish and spoon the marinade over it. Allow to sit approx. 15 minutes before baking. Preheat oven to 400-450o F (yes you want it hot). Place the salmon in the oven and cook for 12 minutes or until it is almost cooked through. Remove the skin before serving. Cook the haricots verts briefly. Either blanch them in a pot of boiling water for 1.5 minutes or microwave briefly. Whisk together ingredients in the Vinaigrette. 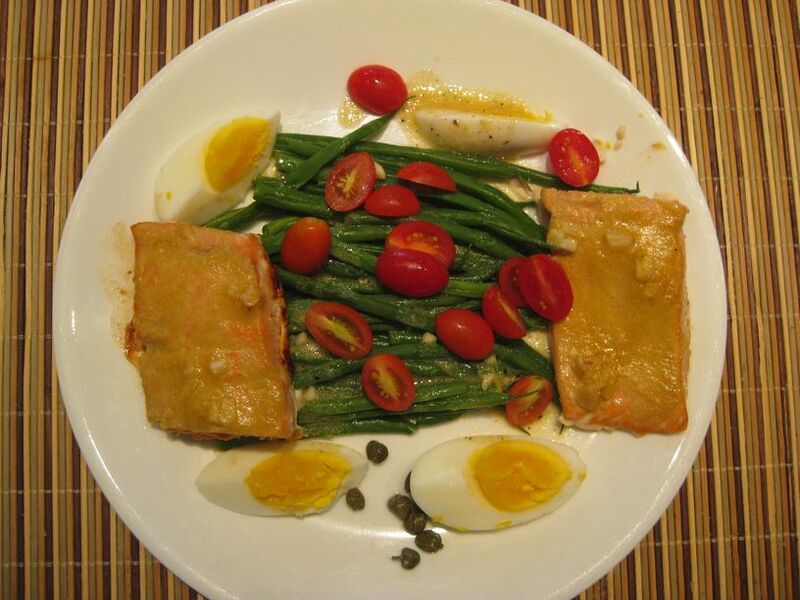 Arrange attractively on two plates placing haricots verts in the middle, cut each salmon fillet in half and place on the sides. Place eggs, capers and any optional ingredients on the other sides, and sprinkle the tomatoes on top. Re-whisk the Vinaigrette to make an emulsion and drizzle some over the fish and vegetables. Serve the remainder on the side.